Urbanization is one of the most dramatic global social transformations of the present society. From an overwhelmingly rural dominance in 1900, the world has fast transformed itself into an urban society. Today in the world as a whole the process of urbanization is accelerating rapidly. Bangladesh is one such country. Bangladesh, a country of 147.960 Sq. km. is one of the most density-populated countries of world. It has a population of 122 million and its per capita income is US $ 245 (BBS: 1996). Bangladesh suffers from different natural disasters, which affect a large number of populations who are vulnerable to different exploitation. According to UN projections (1990: 125), the size of the urban population in Bangladesh will be about 100 million by the year 2025. While the size of its urban population draws one’s attention, rapidity of the growth of its urban population deserves special emphasis. Urban population in Bangladesh is projected to grow more than 5 times. Between 1951 and 1974, a consistent definition of urban areas was followed in the censuses of Bangladesh (BBS, 1974; Census Commission, 1961). In 1981, urban places were redefined following the decentralization policy, which was fully implemented all over the country in 1982. The preliminary counts of the 1991 census of Bangladesh show one tenth of the total population of Bangladesh live in municipalities and following Jordan, it may be safely assumed that about one fifth of its population live in urban areas (BBS, 1991: 10-13 Jordan, 1993: 12). From the beginning of 20th century (1901) till 1991, about 21 million people were added to the country’s urban population, showing more than 30 fold increase as opposed to only about 3 fold increase (from 28.2 to 88.3 million) or rural population. From the trend of growth of urban population, it may be said that the urban population grew at an annual rate of 1 to 2 percent during the British period and about 4 percent during the Pakistan period, with two noted exceptions. 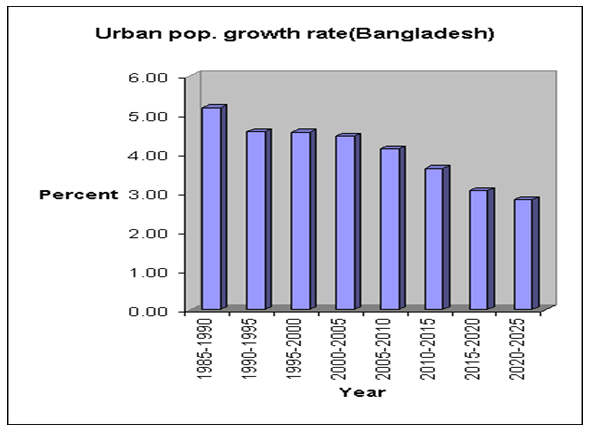 The rate of urbanization shot up after liberation of Bangladesh from Pakistan and subsequent spread of economic and commercial activities in the urban centers. The number of urban centers sprang up from 78 in 1961 to 108 in 1974 and 491 in 1981 (UN, 1981: 24; CUS, 1990:13). Before 1974, there were no million cities in Bangladesh1. After 1974, Dhaka emerged as the only million cities in Bangladesh and Chittagong joined that rank in 1981. These two cities absorbed a little over a third of the urban population in 1981. Cities having a population of between 100,000 and a million remained stationary at two between 1901 and 1951 and then rose to 5 in 1974 (from 4 in 1961) and 11 in 1981. Up to 1921, there were no intermediate size towns, having population of between 15,000 to 100,000 inhabitants. In 1921, there were only 5 such towns, which rose to 69 in 1981. In sharp contrast, even a cursory look at the urban population distribution over the years reveals that much of the increase of the urban population is concentrated in the four major cities of Bangladesh, particularly in recent years. Each of these cities constitutes a part of the four major regions of the country, viz., Dhaka Chittagong, Khulna and Rajshahi. With an area of 147,000 square km, Bangladesh is a small, predominantly agrarian economy. However, it is experiencing a very high rate of urbanization. As (table 1) below shows, in 1974, only 8.8 per cent of the population lived in urban areas. By 2001, total urban population as a percentage of total population was 23.40.If we compare it to more recent years, the percentage of urbanization is now over 25 percent and growth rate is more than 3.5 per cent per year. Urban Administration in Bangladesh consists of the corporations, directorates, attached departments, bureaus and other specialized organizations at the urban areas with specific functions, jurisdiction and visions related to the urban development. So, the urban local government (city corporations and pourashavas) and the urban administrative unit of the central government are not the same. Rajuk (Rajdhani Unnayan Kartripakkha) a statutory body entrusted with the responsibility of initiating and implementing urban development plans through planning. 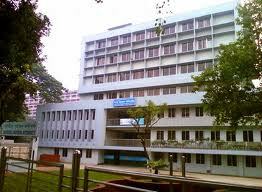 Its precursor was the Dhaka Improvement Trust (DIT) which it replaced in 1987. DIT was founded in 1956 under the Town Improvement Act 1953 with the special objective of undertaking development programmes for Dhaka and Narayanganj and for some other areas in the vicinity of the two towns. A 13-member board of trustees formed the apex of the DIT administrative structure with a chairman at the top. The development challenge posed by the rapid urbanization of Dhaka and its environs in the 1970s and ’80s necessitated amendment to the administrative and legal structure of DIT. Rajuk is now a public body managed by a board comprising a chairman and not more than five members. The chairman is the principal executive of RAJUK and the other members are government officials. All members of the board are full time officials with specific responsibilities within the broad framework of the Rajuk set-up having five different divisions such as, development and engineering; estate and land; finance, budget and accounts; planning; and architecture. Rajuk is a giant organization as regards capital input and development activities. But its administrative structure, planning and co-ordination do not support the scale at which it is working. Its executive chief is a government officer at Additional Secretary level and his autonomy is constrained by the frequent interference by the Ministry of Housing and Public Works under which Rajuk operates. The organization loses its efficiency in work often because of corruption and a lack of interdepartmental co-ordination. One common allegation against Rajuk is its operations as an organization for serving the interest of the people close to power and especially, the members of the party in power. Projects take so much time in implementing that feasibility study loses value at the time of their implementation and as a result, many of the otherwise valuable projects are either finally discarded or embroiled into endless litigation. WASA Dhaka (Water and Sewerage Authority, Dhaka) responsible for water supply and sewerage network in Dhaka city. It is a semi-autonomous organisation under the Ministry of Local Government and Rural Development. Established in 1963, it is managed by a board and headed by a chairman. Before its establishment, Dhaka Municipality and the Department of Public Health Engineering provided water supply services. At present, the WASA Dhaka has the responsibility of providing pure and safe drinking water to city dwellers on a regular and continuous basis and disposing sewer regularly. Water and sewer rates are collected from consumer households and establishments. It supplies water through its Water Works at Chadni Ghat and 116 deep tubewells. In the mid-1990s, it supplied about 94 million gallons of water per day against a requirement of estimated 160 million gallons. Piped water supply is available to about 60% of the city population. But the city dwellers often find that the water is contaminated and needs boiling at home for drinking. Because of leaks in pipeline, imperfect water taps and misuse, Dhaka WASA incurs a system loss estimated at around 45%. Also, the water supply falls short of demand in the dry months because of diminished underground water level. WASA Chittagong semi-autonomous corporation engaged in water supply and drainage system in the port city of chittagong. In terms of administration it is under the Ministry of Local Government and Rural Development. On 16 October 1963, the government promulgated the Water Supply and Sewerage Ordinance 1963 and on 7 November that year, the Chittagong Water Supply and Sewerage Authority was founded. The organisation started working with a project aiming at water supply covering wide areas of the port city. The work was completed in 1969. Consequently, it was possible to supply 15 million gallons of water in the city, and distant places such as Kalurghat in the east, Halishahar in the west, Fauzdarhat in the north, and Patenga in the south came within the reach of water supply system. Later, as the city area grew larger, population increased, water-based industries came into being, and marketing area of various commodities extended. Establish National Water Supply & Sanitation Information Center as a center of excellence for sectoral information management. In the backdrop of a rapid urbanization associated with population increase and economic development in the early sixties, , the Urban Development Directorate was created in July, 1965. To advise the Government on matters of policy relating to urbanization, land use and land development. To prepare and co-ordinate regional plans, master plans and detailed layout and site plans for the existing as well as the new urban centers excluding the areas covered by the present town development authorities of Dhaka, Chittagong and Khulna. To undertake socio-economic research and collection of data for determination of the location and pattern of future urban development. To prepare programmes for urban development execution by the sectoral agencies and secure approval of those from the National Council and assist the agencies in selection of sites for implementation of those programmes. To act as a counterpart organization and focal point in the Government for all internationally aided physical planning and human settlement programmes in the country. To conduct in-service training of the officers and staff of organization involved in spatial planning and development. To advise the existing urban development authorities on their operations at their request. The Roads and Highways Department (RHD) was created in 1962 when the old ‘Construction & Building (C&B) organisation was split into 2 separate bodies (the other being Public Works Department). RHD is responsible for the construction and the maintenance of the major road and bridge network of Bangladesh. RHD is responsible for the management of the National, Regional and Zilla road network of about 21,000 Km in road length and some 18,258 bridges with annual development and revenue funds of 3,463 crore Taka of which about Taka 2,547 crore is from the Annual Development Budget and Taka 916 crore from the Revenue Budget in fiscal year 2007-08. RHD has been at the fore point in Bangladesh to introduce E-governance. RHD had officially launched RHD Website in July 2003. The Website contains a wide variety of information on technical and managerial issues. This includes roads and bridges data, personal data, financial project information, different manuals, standard test procedures, design standards for roads and bridges as well as management plans for each area. The total number of posts in the Department is almost 20,000. Preparation of master plan for Chittagong city and the area in the vicinity and its continuous review. Preparation of short term and long-term development programs for improvement and expansion of Chittagong city. This includes construction of new roads, widening and improvement of major city roads, construction of shopping complex, development of industrial and residential estates and commercial plots and other necessary urban developments. Exercising planning control over the structure plan as per provision of CDA Ordinance and Govt. approved Master Plan. Development control within the preview of Bangladesh Building Construction Acts, 1952 with its subsequent revisions. Keeping in mind the problem as mentioned in the introduction, KDA was created as semi-autonomous body on 21 January 1961 by the then East Pakistan Govt. by an ordinance called ‘The Khulna Development Authority Ordinance, 1961. It was established for planned development and expansion of Khulna City and its suburb areas. At present KDA is working under the Ministry of Housing and Public works of the Government. Sustainable urban development therefore depends upon the capacity of local authorities to generate sufficient levels of municipal revenue to sustain urban infrastructure investments. This requires understanding the local community’s needs and demands, and implementing affordable and equitable cost recovery systems. (1) Vision of UDD is to augment the quality of life of the people by improving the environment through planned development activities for adequate infrastructure, services and utility provision, to make optimum utilization of resources especially land and to ensure a geographically balance urbanization. (2) It also aims to reduce local and regional disparity by alleviating poverty and to create good government in the country through people participation and empowering of woman. Urban Development Directorate would welcome any co-operation, assistance and patronage from national and international quarters. Participate in wider scale in national building activities with national and International development partners like UNDP, World Bank, IDA, ADB, EC, JICA and other organizations. Urban development directorate (UDD) was created by the then East Pakistan government on 17th July, 1965, with secretary of the provincial as its director. (a) To advise the government on matters of policy relating to urbanization, land use and land development. (b) to prepare and co-ordinate regional plans, master plans and detailed layout and site plans as is clear from the original order of the government. In the backdrop of a rapid urbanization associated with population increase and economic development in the early sixties, it was keenly felt that a regional and central and central urban planning office was to be created. Accordingly, the Urban Development Directorate was created in July, 1965. Along with the official responsibility of advising the government on matters of policy relating to urbanization, land user and land development, Planning Commission of Bangladesh has taken decisions to-Make UDD involved in the preparation of Regional Plans in the “Rural Town Development Project” – An EC aided project proposed by LGED. Preparations of Master Plan/Land Use Plan of 50 District Towns. Preparation of Master Plans/Land User Plans of 392 upazila shahar/paurashavas of the country. Preparation of Master Plans/Land Use Plans for 6 newly declared Paurashava such as Tongipara, Katalipara, Godagari, Kalaroa, Rohanpur and Haragach. Bangladesh National Report on Human Settlements (Habitat-II)-1996. Bangladesh National Report: Program of Implementation of the Habitat Agenda (1996-2001). Preparation of Master Plan for Khulna Metropolitan City. Preparation of Master Plan for Rajshahi Metropolitan City. Dhaka Urban Integrated Development Plan. Presently UDD is involved in the following activities. Preparation of Master Plan/Land Use Plans for 15 newly decleared Paurashavas. Preparation of Structure Plans, and Action Area Plan for 12 District Towns. Preparation of Structure Plans, Arban Area Plan and Action Area Plan for 267 Upazila Towns/Paurashava. Preparation of Master Plans for Development of Eco-Tourism centre in Cox’s Bazar Sea-Beach Area and Preparation of Master plans of Cox’s Bazar Town. Technical Assistance for Strengthening Physical Planning Capability of the Urban Development Directorate of updating upazila and district Town Master Plans. Urban Indicators Study Projects for 14 cities of Bangladesh. Preparation of Master Plan/Land user Plan including Drainage, Traffic and Environmental Management Plan for Homna Paurashava under Commilla District. Preparation of Regional Plan for Bogra region. Preparation of Regional Plan for Comilla region. Preparation of Development Plan for 3 Hill districts Rangamati, Khagrachori and Bandarban. Holding national and international seminars and conference on issues related to urbanization, human settlement and human resource development to disseminate knowledge and to share experience to enhance quality of life in the country in general and in urban areas in particular. National Physical Planning Project (1st phase), in co-operation with UNDP, 1978-1982. Urban Housing Policy and Programme Development (1st phase) with UNDP assistance, 1978-1981. National Physical Planning Project (2nd phase), with UNDP, UNCHS assistance, 1983-1987. Housing Sector Institutional Strengthening Project, with ADB assistance, 1992-1993. A project titled “Pakistan: Location and Planning of Cities in East Pakistan” that was undertaken by the United Nations in the year 1960 and was executed in mind 1960s. Studies carried out jointly by UNDP, UNCHS and UDD under the project “Bangladesh Physical Planning Project”. The Draft Physical Planning (Land Use) and Development Control Ordinance in its Land Policy Context, David L. Willcox (26/2/82-28/3/85). The Physical Planning (Land use) and Development Control Ordinance 1985, updated by David L. Willcox and Nuruzzaman Chowdhury, March1985. Final Report of Mr. Nuruzzaman Chowdhury, National Consultant in Planning Legislation, 7-21, September 1985. As a result of the above mentioned report and studies the draft Physical Planning (Land use) and development Control Act, 2003 are in the active consideration of the present government. At present Urban Development Directorate is implementing one project titled “Preparation of Structure Plan, Master Plan and Detailed Area Plan for Sylhet and Barisal Divisional Towns”. Total cost of the Project is Tk. 55.19 million. Starting from July, 2005, it will be accomplished in July, 2008. Sylhet and Barisal , the new divisional towns of Bangladesh have been playing a very important role from the British period. Development potential of the two towns increased manifold with the upgrading to Divisional towns. To control, guide and monitor the development activities for the planned growth Structure Plan, Master Plan and Detailed Area Development Plans for the newly declared divisional towns are of utmost importance. Planning area will cover other than the wards of the City Corporations, the adjacent mouzas, encompassing all the existing important land uses around the municipal area. Zone of influence/catchments area of the towns including areas having potential for development with in next 20 years up to 2024; have also been considered in delineating Planning/Study area. The Planning area for the preparation of Structure Plan, Master Plan and Detail Area Development Plan for each of Sylhet and Barisal divisional towns is approximately 20,000 acres each. After the accomplishment of the project the inhabitants of the towns will enjoy manifold advantages. The project will be able to eliminate the urban monotony and help the residents to breathe in a livable town which will be environmentally sound, economically sustained and socially just. Urban Development Directorate (UDD), Under Ministry of Housing and Public Works GOB, has started implementing “Preparation of Structure Plan, Master Plan and Detailed Area Plan for Sylhet and Barisal Divisional Towns Project”. Consortium of Sheltech (Pvt) Ltd. and Engineering and Planning Consultants Ltd. has been selected consultant for Sylhet. On the other hand consortium of Engineering and Planning Consultants Ltd. and Sheltech Consultant (Pvt) Ltd. has been selected consultant for Barisal Divisional Town. Project duration is eighteen monthly ending in January 2008. Consultancy fee including areas under the jurisdiction of each city corporation for each of the town is TK 22.774 million. Project area covers about 20,000 acres. Presently area under the jurisdiction of Sylhet and Barisal City Corporation is about 6,500 and 11,000 acres respectively. Corresponding population is 3,36, 240 and 2,58,827. 1. Determination of long-term distribution of population in the city. 2. Framing of policies for the best use of land and its control. 4. Guide line for exerting development control in areas for which plan have been made. 5. Determination of (a) Presents and future functional structure of the city. (b) Mechanism for improving and guiding development (c) Formulation of bankable development projects. 6. Paving ways and means for (a) Increasing of capacity of local development agencies (b) Mobilizing local resources through popular participation. 7. Suggest “modus operandi” for better coordination and co-operation among development agencies involved in providing infrastructure, service and utility facilities. Project Director and the consultants have already visited the towns and meet the honorable Mayor, different ward commissioners officials of LGED, R&H, PWD, PDB, DPHE, WDB and other stake holders through out their all out co-operation and guidance of quick and smooth implementation of the project. It is believed that prosperity measured in-terms of human development scale, lies in sustainable development through judicious utilization/conservation of nature. Cox’s Bazar, one of the 64 district head quarters of Bangladesh, is the only sea beach resort town of the country. It is renowned for the sea beach, which is also globally regarded as the longest natural sandy beach. The beach starts from Cox’ Bazar town, extends beyond Teknaf and goes up to the southern tip of Bangladesh. The estimated cost of the proposed project stands at Tk. 50.57 million. The planning area may cover mostly the 85 km. elongated sea beach area from Cox’s Bazar to Teknaf and the area of its vicinity which is about 8889 acres. The Development Plan for Cox’s Bazar Town may cover mostly the municipal area and the existing important landuses around it which is almost about 10,000 acres. Zone of influence or catchments area of the beach, potential for development within the next twenty years up to 2025 have also been considered in delineating planning area for the Eco-tourism Area. This project is now waiting for the final approval of Planning Commission. The Sundarbans of Bangladesh have been declared a Natural World Heritage site by UNESCO. One of the few existing biologically productive natural ecosystems of the world.,the Sundarbans are also the world’s largest mangrove forest. It covers approximately 9300 sq.km of land and water. The total area of the Sundarbans in Bangladesh is 5,771sq.km(almost 62 percent of the total) – the remaining area is in India. The part of the Sundarbans lies in India, where it has been designated the Sundarbans National Park, also a World Heritage Site. The Bangladesh site of the Sundarbans consists of three wildlife sanctuaries – Sundarbans East, Sundarbans West, and Sundarbans South – on the deltaic islands of Khulna, Bagerhat, Satkhira and Patuakhali districts. The characteristics tree is the Sundari (Heritiera Littoralis), from wich the name of the tract had probably been derived. UNESCO inscribed the Sundarbans on the World Heritage List in 1997. The immense potentiality of this extra ordinary forest along with the UNESCO’s declaration opens sky rocketing opportunities for development of Ecotourism in this site. The main tourist spots inside the Sundarnbans include Hiron Point (Nilkamal), Katka and Tin Kona island, These places offer the best vantage points for watching Tigers, Deers, Monkeys, Crocodiles and Birds. Another major attraction inside the Sundarbans is Dublachar(island), a fishing village. Thouslands of tourists visit the areas because of their diverified glorious potentiality for tourism. As a result, development of tourism industry deserrves due importance keeping peace with the increasing demand for the same. In fact, there is ample opportunity for developing Sundarbans as a demand tourism site with the provision of necessary tourism related services and facilities. Globally tourism industry has developed in a versatile manner. Product diversification might act as a crucial factor for the development of the industry in the country. Considering the potential of diversified product as Sundarbans and its adjacent area, there is abundant scope for flourshing tourism, Cultural Tourism, Recreational Tourism, Eco-Tourism in the area. All is needed is to develop the area in a planned way to turn the potential into reality. Hence, there is a pressing need for prepare a development plan for the area to allow the planning process compatible with the tourism potential. This would require an Integrated Sustainable Development Plan for this area. The Project Proposal for the Plan is now under the active consideration of the Ministry to be sent to planning Commission for final approval. In spite of the annual national growth rate of 1.47 percent, urban population growth rate is still as high as 4 percent and for Dhaka it is nearly 6 percent. In this context, dispersion of urban growth, decentralization of administration and a geographically balanced growth of urban centers were adapted as the urbanization strategy by the government. As a result developments of small and secondary towns were given high priority. Infrastructure, service, utility and amenities were improved through planned development activities. The Directorate prepared Structure Plan/Master Plan/Land Use Plans for 50 District towns between 1981-1992. Since the stipulated Plan period has passed and planning being a continuous process, those plans are urgently required to be revised and updated for the greater national interest. Planning area will cover mainly the whole Paurashava area and the adjacent mouzas encompassing all the existing important land uses. Zone of influence/catchments area of the towns including areas having potential for development within the next 20 years up to 2028, will also be considered in delineating Planning/ Study area. The Planning area for the preparation of Structure Plan and Action Area Plan for each of the 12 District Towns is considered to be maximum 10,000 acres on an average. The estimated cost of the plan is Tk. 180.22 million. The 12 District Towns are Comilla, Kishoreganj, Manikganj, Munshiganj, Mymensingh, Narayanganj, Narsingdi, Jessore, Jhinaidah, Bogra, Pabna and Moulvibazar. The Project Proposal is now under the active consideration of the Ministry to be sent to Planning Commission for final approval. Bangladesh is predominantly an agricultural country, characterized by very low land man ratio. The level of urbanization is 25 percent (WDB, 2007) with more than 30 million people living in the urban area. The trend for the last few decades reveals that the growth of urban population has doubled in every 12 years. The high level of urbanization is mostly liable to diminish the agricultural land to urbanization purpose. About 1% of agricultural land in each year is transferred to another use. If the present unplanned urbanization continues, the stock of agricultural land of the country would diminish soon. A huge amount of land in unplanned utilization remains under used, misused and become wastage. A plan is required so that no unauthorized and unplanned development, either in urban area or in rural area, can be taken place. The Directorate prepared Master Plan / Land Use Plans for 392 Upazila shahar / Paurashavas between 1981-1991. There is an urgent need for review of those along with the new Structure plan for guiding the land use transformation in the whole upazilla. Structure Plan for the whole Upazila is utmost important to protect our agricultural land from any other unplanned transformation. Urban Area Plan for the Upazila Towns/Paurashavas is needed to allow the towns to play their role within the physical planning, agriculture, transportation, drainage, water Supply, housing and other important relevant sectors. Action Plans would also be needed for those areas where immediate (in 2-3 years) actions are needed, such as Growth Centres, Rural hats/Rural centres, Union headquarter etc. The Planning area for the preparation of Structure Plan, Master Plan and Action Plan for each of the Upazila is considered to be 75,000 acres on an average. Total project cost is estimated as Tk. 556 million. Soon the Directorate will send the Project Proposal to the Ministry for approval. Homna Paurashava, under Comilla district is the centre of Homna upzila. It is about 60km., almost 2 hours bus journey from Dhaka City having a population of 26,068 (B.B.S., 1991) in 2900 acres of land. It stands on the southern bank of the river Titas – a tributary of the great river Meghna. The entire upazila is in the catchment area of the Meghna and the area is low lying. Main drainage of flood low is facilitated by Kathalia river, distributaries of Titas river and many khals existing in the area. The explicit north-souty orientation tendency of the scattered settlements selected by the local people to cause minimum obstacle to the natural flood flow, which takes a south, south-west direction at the highest stage of the Meghna. Settlements like Homna, developed on the natural flood embankment along the river Titas, also causes minor obstancle of river flow. As the area is low, homesteads are build on mound of soil collected by excavating ponds of ditches at suitable locations near by. These hydrological and river morphological characteristics along with local topography and soil parameters should be considered before undertaking any development activity in the in the paurashava. Major portion of population is in the working age between 18-59 years. Sustainable development of the paurashava and the upazila at large lies in the judicious exploitation of the natural endowment in the form of fertile soil, abundant water and intelligent work force. The area has a very high potential for agriculture and pisciculture and related forward and backward linkage activities. As such the paurashava should be developed in to a compact, highly efficient urban centre that would facilitate the smooth supply of goods and services to and from the rural area. The paurshaava has an average population growth rate of 2.0% per annum, slightly higher than the national growth rate of 1.47% but considerably below the average growth rate (3.2%) of national urban population, but markedly below the annual growth rate (6%) of Dhaka City. This small growth rate indicates very slow urbanization which should preferably be encouraged to take place within the area bounded by the road starting from the bus stand up to the madrasha on the east from JAICA school to the bus stand on the south, since the above mentioned embankment like roads along with electrical lines would prove good accessibility and easy electrification the area. Plenty of vacant land would provide easy replotting with efficient infrastructure, service and utilities economically in a planned way initiated by private individual, group, NGO or any other stakeholder. Drawing no. 8 may provide an example in this regard. Extent of earth filling and other soil parameters required for any development work suggests construction of semi-pucca or at best pucca building of one or two stories. Flood level should be considered at the time of fixing plinth level of any structure. Septic tanks and soak wells, preferably on community basis may be used for sanitation. Treated surface water may serve as potable water to get rid of the memace pf arsenic. Liquefied Petroleum Gas (L.P.G.) in cylinders may be used as fuel instead of gas supplied through pipelines to ensure cost effectiveness. Domestic waste may be utilized through compositing or in biogas plants, which again may be developed on community basis. Collection of rainwater to the nearest lawland and provision of sufficient cross drains in the road to facilitate passage of water to near by low land should be the strategy for avoiding drainage and water logging problem. As has been stated earlier that an efficient and sustainable drainage system depends on the successful solid waste management, for which peoples awareness about their right and obligation to the society is very important. Because of the poor financial and technical capability of the paurashava clinical waste generated especially in the upazila complex should be incinerated or otherwise properly dealt with by the hospital authority. Homna paurashava has a contribution of only 0.0184% (i.e., Tk. 43621.62) in the Gross Domestic Product (GDP) of Tk. 2370740 million. In the financial year 1994-1995 to 1999-2000 ADP allocation for the projects being implemented in Homna Paurashava is Tk. 119429498 which is 0.014796% of the total ADP for 2004-2005 Financial Year (BBS, 2002: Provisional Estimates of Gross of Domestic Products). For economic development of the locality, a boost in the prevailing agro-pisciculture based primary activity through judicious supply of speed, water and fertilizer etc should be resorted to. Resource thus generated should then be invested developing agro-based secondary activities and capacity building of the local human resource. For this to take place facilities should be developed commensurate to the affordability of the urban dwellers. Arrangement for peace and security in the area is also important for a decent urban living. Sayestagonj is one of the paurashava in Hobigonj district under Hobigonj sadar upazila. The paurashava is bounded on the north by Amuarchar, Alapur, Banipara mouza and on the east by Barachar mouza of Hobigonj upazila, on the south by Sylhet Dhaka National Highway and west by Khawi river. It is a renowned Railway Junction and is intersected by numerous railway lines. The paurashava lies on 24°-15′ to 24°-20′ north latitude and 91°-20′ to 91°-30′ east longitude.Sayestagonj, is a very old settlement, acts as the access way to the divisional town of Sylhet. Nothing is known definitely about the origin of the name of the settlement. Available information proves that it takes its name from the name of the Zaminder Sayesta Mian. Sayesta Mian established a Bazar in that place, latter it was called Sayestagonj.The paurashava occupies an area of about 6.4 sq.km. (1581 acres). The paurashava consists of full and parts of 9(nine) mouzas. These are Bagnipara, Sudiakhola, Lanjapara, Char Noor Ahmed, Jagonnathpur, Biramchar, Ubahata and Chholabad. Available information shows that the area is only a few feet above the sea level. The land is alluvial and cultivable. It looks like an unbroken flat land traversed by some small canals. The area of the canal is about 0.60 hectars. According to population census of 1991 total population of the zila and upazila area were 15,26,609 and 225,469 respectively. Population density of the zila and upazila were 579 and 889 persons per sq. km. respectively. In 2001 population of the zila increased to 65,45,078 and in the paurashava to 34,530. The total area of Saystagong paurashava is 1580 acres, out of which 371 acres are used for residential purposes. According to the projection the estimated population of the paurashava area ammounted to 33,103 for the year 2020. The planning area is considered as 1971 acres to accommodate the population. As a fast growing urban center Sayestagonj paurashava has inadequate public services and facilities. The under provided services are electricity, drinking water, drainage and garbage disposal. starting from Chunnaruhat-Hobigonj road to union parishad office/BRAC health Centre. Widening of existing roads for ensuring road reserve for future road widening. Dumki is a new Upazila of Patuakhali district under Barisal Division. It came into existence by a Govt. Gazette of the People’s Republic of Bangladesh dated Thursday, November 25, 1999. It consists of 4 (Four) Unions named Pangashia, Lebukhali, Muradia of former Patuakhali Sadar thana and Angaria Union of former Bakerganj thana. There are 23 (twenty-three) Mouzas under these four unions. As per Upazila statistics, Dumki has a population of 61,68 in 2004 and its area is 91.52 sq. km. From local history, it is found that the name “Dumki” has been originated from the word “Bifurcate/branching into two directions”. It was the estuary of two rivers named Tentulia and Payra. These two rivers perished slowly during course of time. It was said that, once upon a time, there was tremendous influence of angels in this area. This area was also known as Debir Char. A Govt. Primary School (Debir Char Dumki Govt. Primary School) was named to angels to preserve the memory of their activities. It was also said that these angels ruined the rivers by pulling them into two directions or bifurcated them resulting the accretion of a char. Still there remains lively virile of these rivers. As the char area is created due to bifurcating of two rivers, it is called by Dumki. This area/region was previously famous in the history by the name of Chandradwip where artists, woven traders, pottery manufacturing & marketing were prominent features. Barisal was known as Grain Treasure of Bangladesh and Dumki was the focal point of it. Rice of different types & origins were cultivated here. Among them, coarse rice, thick rice, Chingorbushi, Bansbohori, Cotashail, Katabohori, Sakkarkhana, Balam etc. were famous brands. These were pride and prestige of this area. At present, Dumki is recognized as an educational city due to its numerous educational institutions. Well-renowned Patuakhali Science and Technology University (PSTU) is situated here acting as the only Agricultural Institution in the Southern region of Bangladesh. Dumki Thana is situated at the North-east corner of Patuakhali old Sadar and its distance from Patuakhali town is about 10 km. The huge Lohalia & Pandav rivers existed in the north, west and east side of Dumki. Moreover, it was netted by numerous rivers, khal and beels. Though Dumki Thana is constituted with four Unions, it has become an important thana at present. Barisal-Patuakhali, Kuakata Highway, Barisal-Patuakhali to Baufal-Dashmina & Galachipa- the only highway crosses through it. There are some limited numbers of physical infrastructure in Dumki. These are: Upazila Complex, Upazila Health Complex, Lutheran Health Care Bangladesh, T & T Bhaban, Dumki Thana and Grameen Bank. The communication situation is better in comparison to physical infrastructure. It has 354 km. road in total where 320 km. kutcha road, 11 km. pucca road with carpeting, 17 km HBB road and 6 km. CC road. From reconnaissance, it is found that this new upazila lacks of different facilities like: training/vocational institute, playground, auditorium, central Eid-Gah, Housing Estate, Super Market, Bus Terminal, Petrol Pump/Gas Station, Industrial Estate, Central Graveyard/Cremation Yard, Satellite Health Clinic/Community Hospital, LSD Godown/Silo, Children Park, Helipad, Multi-storied Examination Centre, Fire-Station etc. Proper arrangement of the above facilities can only be provided through a well-designed Land use Master Plan to upheld Dumki Upazila as a development model to the country and to the nation and this enormous job is being carried out by Urban Development Directorate (UDD) at present. Majhira is the administrations headquarter of the newly created Shahjahanpur upazila (Majhira union). It is, also the most important market and service centre in the upazila due to Dhaka-Bogra highway which passes through the centre and government policy of administration decentralization and subsequent upgradation of the former Majhira union to Shahjahanpur upazila have helped change the status of the centre very rapidly. The administration decentralization policy of the government and the diversification of activities at the upazila level will create an urban atmosphere at the upazila centre in rural surrounding where people can find non-agricultural jobs and the upazila centre will act as a catalyser for development activities. The main objective of the land use master plan is to help accelerate the development and the proper functioning of the upazila centre. The upazila of Shahjahanpur is located in the southern part of Bogra district, approximately between 240 40/ and 240 50/ North latitudes and 890 15/ and 890 30/ East longitudes. The upazila is bounded on the north by Bogra Sadar upazila, on the south by Sherpur upazila, on the east by Gabtali and Dhunat upazila and on the west by Nandigram upazila. All of these Upazilas, which surround Shahjahanpur upazila, are under Bogra district. Density of population= 1118 persons / sq.km. The upazila doses not posses higher order service facilities within its geographical territory. For higher order service facilities the upazila is dependent on either the next higher order centre at Bogra or the highest order centre in Dhaka. So far the educational facilities are concerned, there are 117 primary schools (84-govt., 31- non govt. ), 31 high schools (non-govt. ), 62 madrashas and 5 colleges (non-govt.) in the upazila. There are no upazila health complex, government or non-government hospitals in the upazila. 10 union health and family welfare centres and 20 community clinics exist in the upazila. 12 banks and insurance, 10 post offices, 1 food storage and one tourist hotel are also functioning in the upazila. There are 14 daily bazaars and 20 biweekly hats in the upazila. Munshiganj came into existence as Thana in 1991. There is no authentic information about the origin of the name of Munshiganj. It is belied that Munshiganj was a part of the Zamindars of the Karticpur under the old district of Faridpur. The family of those Zamindars was known as Munshi family. The old and educated local people are of the opinion that the name Munshiganj was originated form of the name of that family. Later on Munshiganj became one of the sub-division of grater Dhaka. As a part of Government’s policy of decentralization, Munshiganj has Became a new Zila started functioning since January 1984. The paurashava of Munshiganj Sahar was constituted in 1972 covering 4.19 Square miles or 10.85 square Kilometers of land. The headquarters of the Munshiganj zila is located at Munshiganj Shahar.It is lies in 230 33 /north latitude and 90 032 / east longitude on the bank of the river Meghna . The physical feature of the greater Dhaka Zila (old district) is constituted of two natural divisions. One is the high land (20-30m) on the northern part of the zila is known as Bhawal Forest which is continuation of Madhupur tract. The other or the remaining areas of the consist of plain ad low-laying land which inundated in varying degrees during rainy season by the river Jamuna, Padma, Dhalaswari and Lakhya and many other creeks and streams. The new Zila region of Munshiganj falls under this natural division. During monsoon the low-lying areas form a vast swamp and houses all around seem to float on water. In winter and summer when floodwater recede form the fields and the swamps, the plan turns into green dry pastures and crop lands. The old zila of Dhaka is located in the tropical belt and enjoys fairly equable monsoon climate. The temperature is almost uniform thought the year. The maximum temperature is in the month of April when it is recorded as high as 350c and the temperature is in the month of January when it remains as 120c in normal year. The zila is situated at the center of the country with a fairly comfortable climate. More pleasant weather beings form November and continue up to February. Form March the temperature gradually increases and form June to October the average maximum temperature ranges around 31 0c. January is the coldest month of the year. The maximum rainfall is recorded in month of July when it rises up to about 360 millimeters and minimum rainfall is in the month of December when there is hardly any rainfall. The climate of the Dhaka zila is mare comfortable the most of the zila of Bangladesh. Three of the largest river system of the sub-continent passes by and effect the Life and Economy of the zila. To the northwest of the zila the Ganges, otherwise known as the Padma, joins the Bramaputa and Jummna.The combined system of these two rivers again join the river Meghana at the southeast corner of the zila.Again the northeast corner of the zila the old system of the Brahmaputra joins Meghana. The Ganges carries the water of the entire northern India upto Deli. The Bhahmaputra carries the water of North-east India. Dhaka is at the confluence of these two great river system which forms the mighty stream of Meghana falling down forms the mighty stream of Meghana following down to the sea between Barisal and Noakhali zila. As the zila shahar is conceived as focal point of development of the zila as a whole, the activities performed in the zila shahar will act as propulsive factors for generating development trends in the zila. The land use plan prepared for the zila shahar will serve as guideline for a planed and coordinated development up to the year 2025A.D.it will provide efficient transport network, promote development of commerce and industries, extended marketing facilities resulting in generation of more employment opportunities and will indicate more rational use of scarce land resources. The preparation of land use plan is the 1st step to the programme for bringing the whole of the zila under planed development. The other important settlements of the zila are upazilas taken up for planned development to render them healthy, pleasant and growth generating centers. Dhamrai is a historical place. Back in 250 BC, when emperor Asoke was regaining the sub-continent, Dhamrai was one of the 400 selected self-sufficient village of that time. Dhamrai township and the pourashava are situated 25 miles (42 km) north-west of Dhaka, on the north bank of the Banisai River and west if the Dhaka-Archia highway. It is about 8 miles (13 km) north of Savar across the Bansi. The geographic location of Dhamrai is at 230 55 / latitude and 90 013 / E. longitude. Dhamrai upazila is bounded on the north by Kaliakair, to the south by Singair upazila and to the west by Saturia upazila. The geographic location of Dhamrari is at 230 – 55 N latitude and 900 – 13 E longitude. It is situated on a low mound of literite which is an out layer from the high land of Bhawal, standing up amidst the swamps that lie to the north of the Dhaleswari river. The land in Dhamrai is flat and alluvial. Most of the country is inundated during the monsoon. The flood level at Dhamrai headquarters area is about 29.23 ft MSL. The Dhamrai township is on higher grounds above the annual flood level. Most villages are on mounds of borrowed earth and turn into small isolated inlands during the monsoon. The country is predominantly rural . A ribbon development of fast growing urbanization is taking place along the Aricha road where a number of industries have been established and many are in the process of being established. The area is drained by the Bansi river on the south and Gazikhali on the west. In addition there are a number of smaller channel, all from part of the Dhaleshwari river system. Maximum and minimum rainfall is 356 mm in July and 035 mm in December. The maximum temperature recorded in July is 35.3 degree centigrade and 13.8 degree centigrade in December. Land suitable for building is scarce. The vacant land in most areas is low and needs upto a height of 5 to 10 ft. Most of the high land of Dhamrai is densely built- up. Any further construction must be carried by land filling. Also once peaceful residential areas are being dotted with industries of varied description ranging from rice mills to tannery. There is an obvious pressure on land on Dhamrai an urgent need to reserve land for immediate and future uses. If proper planning and control for the land use is not made soon, there will be a scarcity of buildable land for urban and social amenities and an absence of a healthy environment. Dagon Bhuiyan paurashava, under Feni district is the centre of Dagonbhuiya upazila. According to the census of 2001 the paurashava has a total population of 26960 on 3050 acres of land. Although the paurashava is situated in the coastal belt of Bangladesh, it is a bit distant from the sea. Although scattered settlement was observed in the whole of paurashava, it is mainly concentrated along the Feni- Basurhat highway and Feni-Noakhali highway centering the paurashava complex. toowards west up to Aziz Fazilpur mouza. Paurashava was developed mainly in Abhiranpur, Udrajpur, Dagonbhuiyan, Aziz Fazilpur, Betwa and Amanullah mouzas. The paurashava is mainly low lying with numerous water bodies having potential for development of coastal fisheries. As the area is low lying, homesteads are built on mound of soil collected by excavating ponds or ditches at suitable locations near by. These hydrological and morphological characteristics should be considered before undertaking any development activities. Economy of the paurashava is predominantly agro-based because of its fertile soil and abundant water resources and economically active labour force. These have a very high potential for agriculture and pisciculture and related forward and backward linkages. As such the paurashava should be developed into a compact, highly efficient urban centre that would facilitate the smooth supply of goods and services to and from the rural area. The paurashava has an average growth rate of population of 2.3 per annum which is much higher than national growth rate of 1.47 per annum but considerably below the average growth rate (3.2%) of national population; but markedly below the annual growth rate (6%) of Dhaka City. It is noticeable that annual growth rate of the paurashava has increased a lot in 2001 (2.3%) than that of 1991 (1.96%). Although growth rate of the paurashava has increased than the previous decade, small growth rate indicates very slow rate of urbanization in the area. Provision of urban services and facilities has not been developed in the paurashava keeping pace with the growth rate in the area. Plenty of vacant land would provide easy replotting with efficient infrastructure, service and utilities economically in a planned way initiated by private individual, group or any other stakeholder. The paurashava should be developed in accordance to plan proposed by UDD in 2005. Hajiganj paurashava, under Chandpur district is the centre of Hajiganj upazila. According to the census of 1991 the paurashava has a total population of 40259 on 4962 acres of land. It stands on the southern bank of the river Dakatia–a tributary of the great river Meghna. The entire upazila is in the catchment of the Meghna and is low lying. Main drainage of flood flow is facilitated by Dakatia river, and many khals existing in the area. The explicit north-south orientation tendency of the scattered settlements selected by the local people to cause minimum obstacle to the natural flood flow, which takes a south, south-west direction at the highest stage of the Meghna. As the area is low lying, homesteads are built on mound of soil collected by excavating ponds or ditches at suitable locations near by. These hydrological and river morphological characteristics along with local topography and soil parameters should be considered before undertaking any development activity in the paurashava. Major portion of population is in the working age between 18-59 years. Sustainable development of the paurashava and the upazila at large lies in the judicious exploitation of the natural endowment in the form of fertile soil, abundant water resources and intelligent work force. The area has a very high potential for agriculture and pisciculture and related forward and backward linkage activities. As such the paurashava should be developed into a compact, highly efficient urban centre that would facilitate the smooth supply of goods and services to and from the rural area. The paurashava has an average population growth rate of 2.0% per annum, slightly higher than the national growth rate of 1.47% but considerably below the average growth rate (3.2%) of national urban population, but markedly below the annual growth rate (6%) of Dhaka City. This small growth rate indicates very slow urbanization which should preferably be encouraged to take place within the area. Plenty of vacant land would provide easy replotting with efficient infrastructure, service and utilities economically in a planned way initiated by private individual, group, NGO or any other stakeholder. But high land value might act as constraints to development in the area. The paurashava should be developed in accordance to plan proposed by UDD in 2005. “Sitakunda” is one of the three paurashavas of Cox’s Bazar district. It is the heart of the upazila and it is bounded on the north by Mirsharai, on the east by Fatikchari and Hathazari, on the south by Pahartali thana and on the west by the Bay of Bengal. Distance between Chittagong district headquarters and Sitakunda paurashava is 32 km. Sitakunda as a thana came into existence in 1879 and was upgraded into Upazila in 1983. So far it is known that both the upazila and paurashava are named after Sita, a character in Hindu mythology. According to the census of 2001 the paurashava has a total population of 34,530 on 7410 acres of land. The paurashava is situated in the coastal belt of Bangladesh with Shandwip channel in the west and Hills in the East resulting in tidal effect and possibilities of flash flood in the area. Sitakunda is an alluvial deposit. It looks like an unbroken flat land traversed by a number of streams and canals. It is generally below the level of high tide and most of the area goes under water during rainy season. But the paurashava area is free from flood due to the embankment. Economy of the paurashava is predominantly agro-based because of its fertile soil, abundant water resources and economically active labour force. These have a very high potential for agriculture and pisciculture and related forward and backward linkages. As such the upazila should be developed into a compact, highly efficient urban centre that would facilitate the smooth supply of goods and services to and from the rural area. As a fast growing urban center Sitakunda paurashava has inadequate public services and facilities. The under provided services are electricity, drinking water, drainage and garbage disposal. Uncontrolled and scattered developments are taking place in and around the paurashava area. At present, development is taking place along Sitakunda, Mahadebpur mouzas. The Office of the Upazila Nirbahi Officer and other major Government offices, boys’ high school and college etc. are located in these mouzas. The paurashava should be developed in accordance to plan proposed by UDD in 2004. Pekua Upazila, one of the important settlements of Cox’s Bazar district was declared as an upazila in 2002. Formerly it was a part of Chakoria upazila. It is situated on the west of Arakan High way and on the Baniachara-Kutubdia road. Banshkhali bound it on the north, Harbang and Baraitali of Chakaria upzilaon the east. M.B. Char, Badarkhali, mojeskhali (Matamuhuri) and Kutubdia on the south. The upazila is 75 km. from Cox’s Bazar zila sadar and 22 km. from Chakaria sadar upazila. According to the census of 1991 the upazila has a total population of 1,11,017 on 19,513 acres of land. The upazila is situated in the coastal belt of Bangladesh with Kutubdia channel in the west and Hills of Chittagonj Hill Tracts in the East resulting in tidal effect and possibilities of flash flood in the area. The upazila is mainly low lying with numerous water bodies having potential for development of coastal fisheries particularly shrimp culture and salt culture. Economy of the upazila is predominantly agro-based because of its fertile soil and abundant water resources and economically active labour force. These have a very high potential for agriculture and pisciculture and related forward and backward linkages. As such the upazila should be developed into a compact, highly efficient urban centre that would facilitate the smooth supply of goods and services to and from the rural area. The upazila has an average growth rate of population of 2 percent per annum which is much higher than national growth rate of 1.47 per annum but considerably below the average growth rate (3.2%) of national population; but markedly below the annual growth rate (6%) of Dhaka City. Adequate provision of urban services and facilities has not been developed in the upazila keeping pace with the growth rate in the area. Plenty of vacant land would provide easy replotting with efficient infrastructure, service and utilities economically in a planned way initiated by private individual, group or any other stakeholder. The upazila should be developed according to the plan prepared by UDD in 2005. The urbanization and development relationship is also obvious in third world countries, although, urbanization in such regions may not have occurred through industrialization which was the case in the West and in Japan, rather it has probably taken place mainly through the growth of the tertiary sector and the informal manufacturing sector. The other distinguishing feature of urbanization in the western and non-western (developing) societies, is the rapidity at which urban growth and urbanization have taken place in the developing countries. This phenomenon is best illustrated by recent urbanization in Bangladesh. The rate of urban growth has been consistently very high since 1961(Table-1).It will remain high for a couple of more decades (Table 2). The relationship between urbanization and development on a global scale has been well documented and analyzed (for example, Friedmann, 1973, United Nations, 1970). The relationship has been expressed in simple terms as between (a) The degree (or level) of urbanization, and (b) GNP per capita for countries of the world. The relationship has been found to be positive, with economically developed countries generally showing higher level of urbanization. This may lead the uninitiated person to conclude that one effective path to development is urbanization. The positive correlation between development and urbanization is apparent also within the country context of Bangladesh. This can be explained both in terms of economic growth over time for the country as a whole, and in spatial or regional terms. In the support of the former, it may be noted that the contribution (at constant prices of 1984- 85) of the urban sector to GDP of Bangladesh, grew from 25.36 per cent in 1972-73, to 36.39 per cent in 1991-92, (Table 2, and Huq, 1997) and most probably to over 40 per cent by now. Correspondingly, the level of urbanization in Bangladesh rose from 7.86 per cent in 1974 to 20.15 per cent in 1991 and probably to over 25 per cent by now (Table 1). The relationship between urbanization and development can also be visualized from spatial or regional perspective, as shown in (Table 4). District (regional) percapita GDP and composite socio-economic index are positively related to level (or degree) of urbanization (the Spearman Rank-Order Correlation Coefficient is 0.46 for urbanization and per capita GDP and 0.15 for urbanization and composite socio-economic index. Helpless people of Dhaka city…………….. The transformation of lightly populated open-country on rural areas into dense concentrations of people, characterized by the expansion of population from central cities and the migration of people from other areas makes the importance of planned urban development. The main roles of UDD (Urban Development Directorate) in urban development are advising the Government on matters of policy relating to urbanization, land use and land development; preparing and co-ordinate regional plans, master plans and detailed layout and site plans for the existing as well as the new urban centers excluding the areas covered by the present town development authorities of Dhaka, Chittagong and Khulna; undertaking socio-economic research and collection of data for determination of the location and pattern of future urban development; preparing programmes for urban development execution by the sectoral agencies and secure approval of those from the National Council and assist the agencies in selection of sites for implementation of those programmes; acting as a counterpart organization and focal point in the Government for all internationally aided physical planning and human settlement programmes in the country; organizing seminars/workshops for creating batter physical planning awareness and to disseminate information through regular publication of the research and planning materials on urbanization and human settlement planning and development; conducting in-service training of the officers and staff of organization involved in spatial planning and development; advising the existing urban development authorities on their operations at their request. It also aims to reduce local and regional disparity by alleviating poverty and to create good government in the country through people participation and empowering of woman. Now it needs to overcome its weaknesses to make our urban areas more planned and sustainable from environmental perspective. BBS. 1991. Bangladesh Population Census, Government of Bangladesh. BBS. 1996. Bangladesh Population Census, 1981, Report on Dhaka Statistical metropolitan Areas, Government of Bangladesh, Dhaka. BBS. 1997. Bangladesh Population Census, Report on Urban Area, Government of Bangladesh. BBS. 1998. Statistical Year Book of Bangladesh, Government of Bangladesh. BBS. 2003. Twenty Years of National Accounting of Bangladesh, Government of Bangladesh. 8. BBS. 2004. Bangladesh Population Census, Report on Sample Vital Registration in Bangladesh 1981-1992, Dhaka: Government of Bangladesh. 9. Islam, N. 1996. Dhaka: From City to Megacity, Perspectives on People, Places, Planning and Development Issues. Dhaka: USP, University of Dhaka. Islam, N. 1997. “Urbanization in Bangladesh: Temporal and Spatial Pattern and Policy Initiatives”, in Nazrul Agenda in Bangladesh: Critical Issues and the 1995 Survey Findings, Dhaka: University Press Limited for the Asian Development Bank. pp. 57-80. Islam, N. 1997. “Urban and Regional Development in Bangladesh,” in Chatterji, M. and KaizHong, Y. (eds.) Regional Science in Developing Countries, New York: London: Macmillan. UN-ESCAP, 1993. State of Urbanization in Asia and the Pacific, 1993, New York. United Nations. United Nations, 1970. 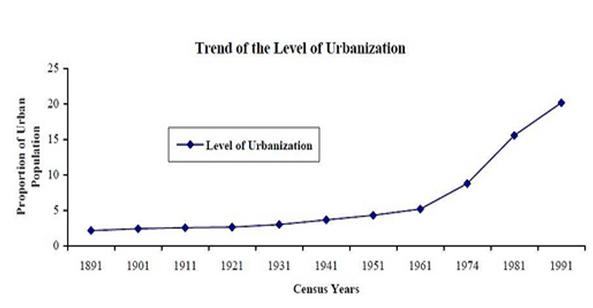 Urbanization in the Second United Nations Development Decade. New York: United Nations. 14. United Nations. 1987. Department of International Economic and Soical Affairs, Population Growth and Policies in Megacities, Dhaka, Population Policy Paper No.8, New York: United Nations. World Bank. 1985. Bangladesh Economic and Social Development Process. Vol. III, (Report 5409), Washington, D.C.: The world Bank. Yasmeen, A. 1990. “Economic Significance of Urbanisation in Bangladesh”, Unpublished Ph. D. Thesis, Department of Economics, University of Calcutta.